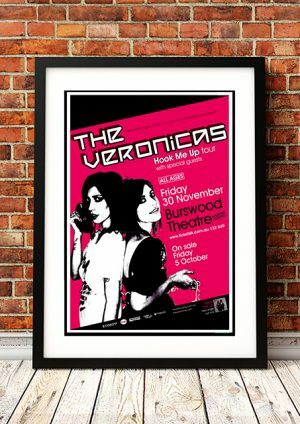 Classic Veronica's Band Concert Posters and Memorabilia! Buy Online Now! The Veronicas hail from Brisbane, Australia, where twin sisters Jess and Lisa Origliasso began working in show business at the age of five. With the help of two friends, the Origliasso twins formed a band, Teal, and released “Baby It’s Over,” a hooky single that made the twins sought-after songwriters. After honing their chops by working with several different collaborators, the Origliassos signed a publishing deal and began contributing songs to a number of performers, including Australian Idol winner Casey Donovan, Japanese pop singer Miz, and the Russian group t.A.T.u. The girls were now focused on becoming internationally successful in their own right, and they moved to Los Angeles to try their hand in America. After changing their name to the Veronicas and turning 20 years old, they landed a deal with Sire, an offshoot of Warner Bros. Records. Sire released the Veronicas‘ full-length debut, The Secret Life Of…, in 2005. Although an international release followed in early 2006, the album fared best in Australia, where it generated three Top Ten singles and eventually went quadruple platinum. Hook Me Up followed in 2007, featuring a new wave-inspired sound and, once again, going multi-platinum in Australia. The girls toured in support of both albums and documented one of their jaunts with a live album, Revenge Is Sweeter Tour, in early 2010. 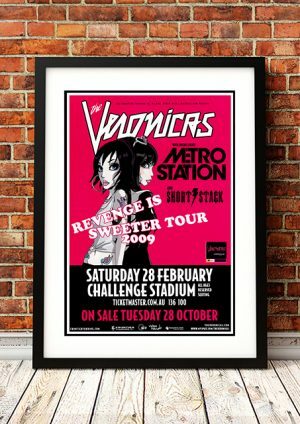 We stock some awesome Veronica’s Band Concert Posters.